Search for homes for sale in Heritage Bay, an active adult community in Barnegat NJ. Call 732-616-6226 when you’re ready to see active adult community homes in Heritage Bay, Barnegat, NJ. Heritage Bay is an Over 55, Active Adult community located in historic Barnegat Township, NJ in Ocean County. Barnegat has a rich heritage. since it was one of the area’s leading seaports. Once upon a time fishing, shipbuilding and glassmaking were the prominent industries. However, today Barnegat has a Historic District with shops, antiquing restaurants and museums. Since it’s located on the Barnegat Bay there are over 6 miles of waterfront, offering swimming, fishing, crabbing and boating. Construction started in 1996 on Heritage Bay, and was completed in 1999. There are almost 300 single family homes Heritage Bay. They are all ranch style homes and they offer two bedrooms, 2 baths and either a 1 or 2 car garage. Home sizes range from 1149 square feet to 1,756 square feet. In addition, many homes in this non-gated community have a three season room. Storage is available over the garage. Nine foot ceilings, recessed lighting in addition to crown moldings complete the picture. Furthermore, Heritage Bay is a pet friendly community. This community is great because it’s minutes from the Garden State Parkway. 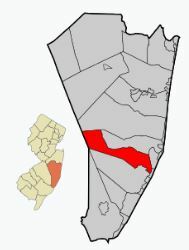 Also, it’s close to upscale shopping, historic sites, and a short drive to Long Beach Island. Heritage Bay is a quiet community with a clubhouse. Tennis, bocci, and a gym are a few of the activities available. You’ll also find a library, clubs, trips, socials and a monthly newsletter to keep you up to date. You can be as active or as in-active as you want. And when it gets warm you can swim in the outdoor pool. The community is only minutes to Long Beach Island, and Atlantic City. Enjoy local activities such as fishing, boating, golf, shopping, dining and much much more. The monthly association fee covers lawn care, snow removal and trash removal.